Data centers of today are dealing with three serious challenges: 24/7 operations, no patience for downtime or data loss and a growing amount of data. Investments in modern storage systems can help the Always-On Business run and meet these needs, but there is a challenge on where and how we will store backup data for the data center of today. Enabling Veeam backup jobs to leverage HP StoreOnce Catalyst allows data to arrive on the StoreOnce device much quicker over slow links. This is thanks to advanced source-side deduplication capabilities of the Catalyst applied at the source, before the data is transferred to the storage device. HP StoreOnce Catalyst integration improves synthetic full backup file creation and transformation performance up to 10 times by removing the need to physically copy data between the existing backup chain and the target full backup file within StoreOnce. As such, creating the new or transforming the existing full backup file becomes a metadata-only operation, and completes much faster. This benefits both primary backup jobs, and Backup Copy jobs — especially those which are scheduled to create periodic Grandfather-Father-Son (GFS) retention full backups (weekly, monthly, quarterly or annually). We are adding a number of under the hood optimizations to help improve recovery performance from backups residing on HP StoreOnce. In our testing, HP StoreOnce Catalyst integration improves the time it takes to boot a VM from backup file residing on StoreOnce about two times comparing to Instant VM Recovery from backup files on a StoreOnce NAS Share. 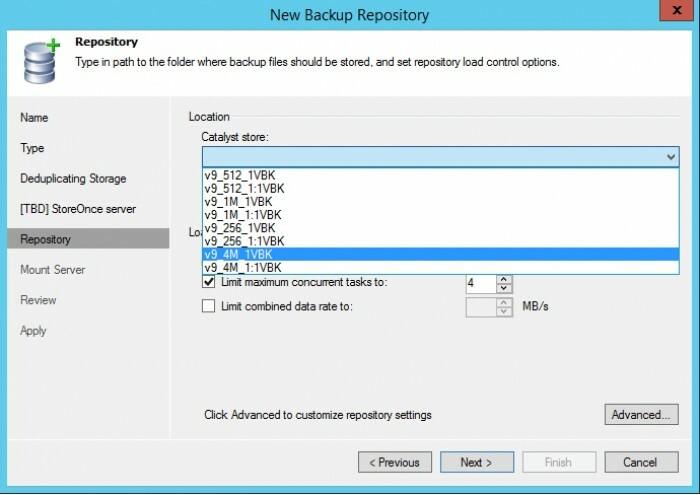 Other recovery types requiring random I/O, including file-level recovery as well as application item-level recovery with Veeam Explorers for Active Directory, SQL Server, SharePoint, Exchange, and Oracle also show noticeable performance improvement, letting you perform granular recoveries faster than before. Please note that for optimal performance, we continue to recommend following our reference architecture and landing backups on raw storage - while using deduplicating storage as a secondary target for long term retention and meeting 3-2-1 backup rule. Nevertheless, these improvements will come handy in certain recovery scenarios – for example, recovery from off-site backup repository – and bring noticeable improvement to recovery experience. Backup over Fibre Channel (FC) connectivity enables local area network-free (LAN) backup to HP StoreOnce, eliminating any load from backup activities and increasing availability of your LAN to production workloads. Keep in mind that zoning of the Catalyst store to the gateway server selected in the corresponding Veeam backup repository settings may be required when setting up this configuration. As you can see, HP StoreOnce integration will enable companies to provide enhanced Availability for the Modern Data Center of today and avoid data loss. There is still more to come with v9 and to be the first to know about them all, subscribe for updates on our Veeam Availability Suite v9 landing page. To learn about current HP and Veeam capabilities visit our HP and Veeam availability solution.